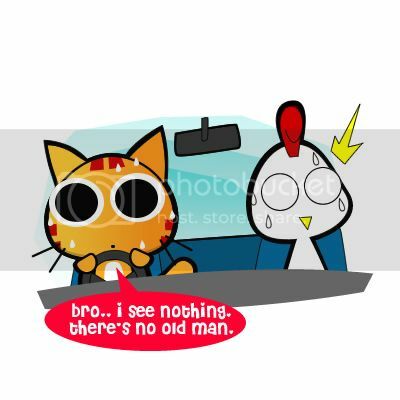 Miao & WafuPafu Comic Blog » What Is The Old Man Looking At? « We can haz Facebook again!! Posted on July 28, 2012 by Jian Akiraceo. 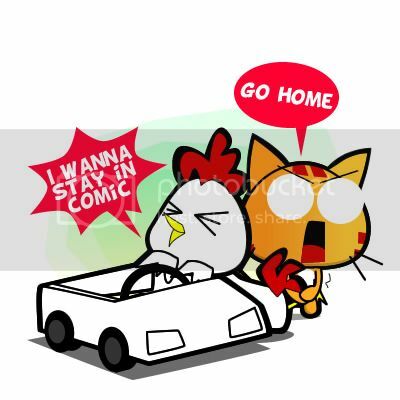 This entry was posted in Outdoor and tagged chicken jack, comic, drive, ghost, miao, old man, spooky. Bookmark the permalink. or maybe what your friend saw was… the slender man! next month is da 7th month in da Chinese calender. O_O what you guys find it funny?? 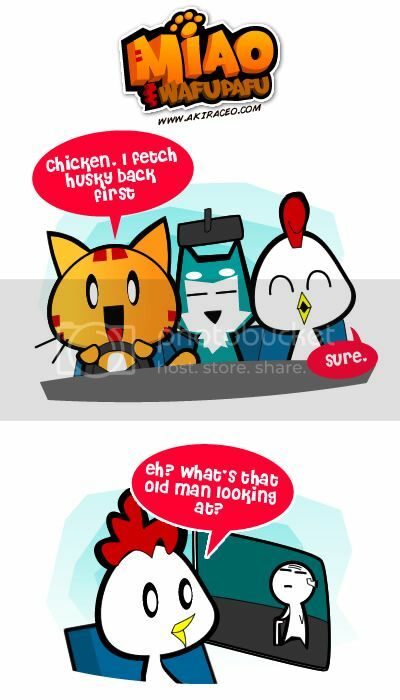 i like chicken jack character! I haven’t really bring out his real character. Creepy. I don’t want a friend who can see or hear something. hahaha but he no wants to go out with me. me too when drawing this. Hello, the 7th Month is not til mid August….. unless…..
Maybe u bring chicken jack to see bomoh or priest…. Beware…. …. Beware as it maybe something bad going to happen to the three of u….. Muhahahahaha…. BTW, u won the animation contest???? Won what animation? The Digicon? The old man sneak out before ghost month arrive? mebbe the old man is in your blind spot? Chicken was too tired, haha! Welcome back! I notices one of your Crocodile buddy is not in the comic. What happen to him? They he leave China earlier then you guest? I also I had a similar experience too on a field trip with a group of friends and coincidently one them had 6 sense. Was the most awkward night even in a hotel and we didn’t dare anything until we leave the place. Yeah.. he went for a business trip 2 days earlier that our plan. Lucky him. wah~… just reach home saw such things~… go buy toto?? @.@…. haha ya… i got friends that like to tell scary stories like that during trips and about the hotels that we are about to stay… and she tell the stories 4-5x over and over again.. =.= and there is this one time i got irritated about that… and i said “ya if you keep telling stories like that it’ll happen to you later… coz each time u tell the story means that you are hopping it’ll happen to you” and after that i never.. Never hear any scary stories from her again. hahaha well.. i have to make her stop… else i cant have a good rest hehe. Maybe u biasa adi and tot no more? I believe there’s a way to simplify it.